Doug Hamilton-Cox (“Monty” to his friends) was born in Somerset – moving to Devon at the age of 8. Doug is married to Sue and has two daughters Debbie and Jo and a son Mike. Doug and Sue are grandparents to Oscar, Ellie, Kiana, Joel, Noah and Yasmin. His roots lay in farming and his expertise in the ancient craft of dry stone walling is renowned across the county. 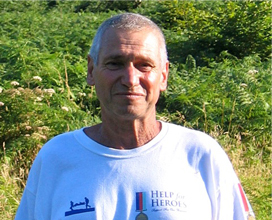 Doug is 67 years old, an ex-Sapper who enlisted as a boy soldier when he was 15, served his apprenticeship in the Royal Engineers, followed by nine years of service including Malaya and Thailand. On his return in 1971 he settled in Devon and started his own digger company, which he runs from Bridford, a small rural village on the outskirts of Dartmoor. With his service background, Doug took a keen interest in the repatriation of our fallen servicemen and women to RAF Lyneham, via the nearby town of Wootton Bassett, and onwards to the John Radcliffe Hospital in Oxford. With his wife and family, he started to attend the ceremonies and pay tribute to the men and women who had fallen. “When the hearses pass through Wootton Bassett, the church bells toll and crowds stand silent, the families dignified in their grief” says Doug “I was particularly moved and wondered what I could do to help”. On one particular occasion, a fellow bystander remarked that Doug's journey from Devon must have taken some time and showed real commitment. "But I only drove here" says Doug - "real committment would have been to walk here." 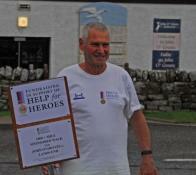 And so began Doug's quest to raise money to help returning troops and their families. 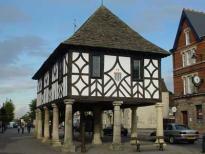 His first walk, as suggested to that bystander, was from his home in Devon to Wootton Bassett. Since then he has followed that up with a walk from Devon to Selly Oak Hospital in Birmingham, now part of the new Queen Elizabeth Hospital. 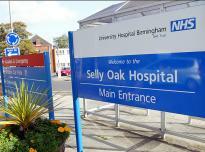 Selly Oak contains the Royal Centre for Defence Medicine, which cares for injured servicemen and women from conflict zones.